Ministry of Propaganda - 24/Jun/2006: "Wiltshire In A Day"
Rumour has it that in particular American and Japanese tourists do 'Europe in a Day' tours ('it's noon, it must be Heidelberg...'). 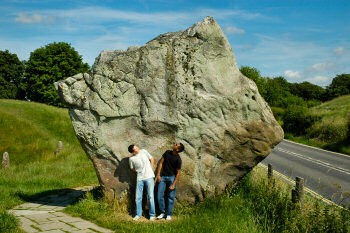 We thought, we can do better than that, we can do Wiltshire in a day. 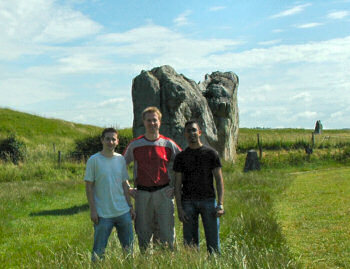 With we I mean Vikash and Chris, two interns working with me here in Swindon and myself. Their time in Swindon will end in about two months, so I thought I give them a whirlwind tour of Wiltshire. We left at just after 9:00 this morning. Our first stop was the Hackpen White Horse, one of the famous Wiltshire White Horses. 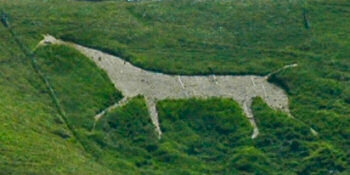 We drove up Hackpen Hill to enjoy the view and walked down to the White Horse for a closer look. From here it wasn't far to our next stop, Avebury. We spent a good 30min here, walking around the ditches and admiring the standing stones. The weather forecast hadn't been too great earlier, but by now the sun had fully come out. Blue skies and warm sun, what more could we ask for? On the way to Devizes we took a detour for our second White Horse of the day, the Cherhill White Horse. This time we only stopped on the A4 Avebury to Calne road for a view and didn't walk up to the horse, but the view from the road is impressive enough. This horse was cut in 1780, with directions being shouted from the main road through a 'megaphone'. 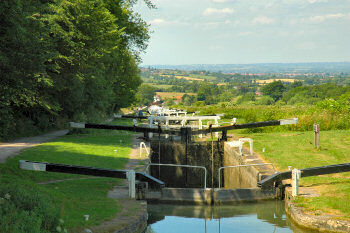 After arriving in Devizes we made our way to the impressive Caen Hill Locks, a place I quite like to visit. We parked in the official car park about half way up and first walked down to the bottom of the 16 locks. Then we worked up an appetite by walking back all the way to the top until we reached the Black Horse pub (doesn't seem to have a website, so unfortunately no link) where we had lunch. The food wasn't majorly exciting but good pub grub, the location being the key ingredient with our table right at the canal. Our first stop for the afternoon was Stonehenge. We didn't follow the hundreds of other tourists who paid to get a little bit closer, instead we just took a quick look over the fence at the monument. From Stonehenge we drove to Salisbury to visit Salisbury Cathedral. A quick walk along the Riverside Walk took us from the car park to The Close with the cathedral. 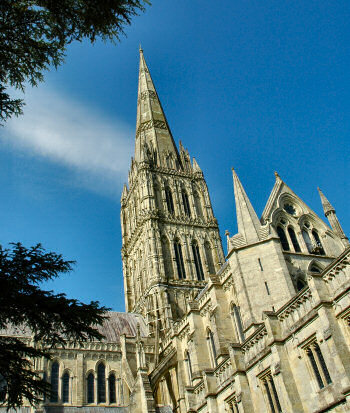 The 404ft high spire is the highest in England and very impressive. We also went into the cathedral, where we took a look at one of the four surviving copies of the Magna Carta. On our way home our last stop of the day was Marlborough. By now it was late afternoon, time for some tea, cream tea to be precise. We went to the famous Polly Tearooms on High Street, where we had a fantastic cream tea. Homemade plain scones, clotted cream, jam and of course tea. Delicious! We arrived back in Swindon at about 18:30 after a great day out in Wiltshire. White Horses, stone circles, canals and locks, beer in a pub at the canal, an impressive cathedral, cream tea, what more can you want?